Kiko Milano 3D Hydra Lipgloss is a softening lip gloss for shiny, plumped lips. 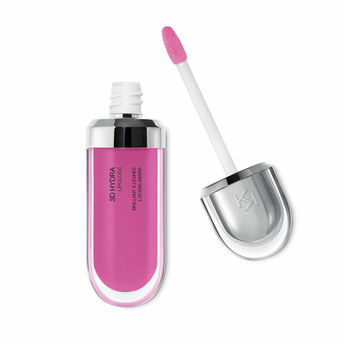 The soft texture feels wonderful, blending into the lips and leaving them smooth and radiant. The formula contains Bidens extract. The application awakens your senses, leaving the lips feeling wonderful. The product glides on effortlessly and adheres immediately. The contemporary packaging stands out with its metallic cap with the KK logo embossed on the side. The soft wand applicator is designed to accentuate the gloss' texture and precisely outline the lips.The lip gloss is available in 30 amazing colours and a variety of finishes: transparent, highly pigmented, shiny and pearly. The non-sticky texture is long lasting. Alternatively, you can also find many more products from the Kiko Milano 3D Hydra Lipgloss range.